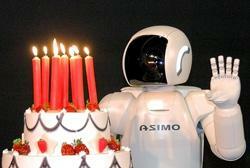 October 31st marked an important holiday…ASIMO‘s birthday! Honda recently released a host of promotional materials to mark the 10th anniversary of the ASIMO project. There is a new App for your smartphone, Run With ASIMO, that lets you walk the robot around, learn ASIMO related facts, and eventually compete against friends in time trials. Honda’s also released a story about ASIMO’s inception and development called “Walking Together“. The best part of the 10th anniversary PR push, however, has to be the new ASIMO video which features the robot on a madcap dash through its own history. You can watch it below. The little guy looks like a robotic Forrest Gump, always running everywhere. Since its beginning, the ASIMO project has been focused on the long term goal of creating a humanoid robot that could live and work beside us. Honda’s patience and forethought in this endeavor have been extraorindary. Millions have been spent and very little marketable technology has made its way out of the project to the world at large to recoup its expenses. Still, I think the auto giant knows that if ASIMO leads to the creation of a real companion robot it would alter the world forever, and catapult the company into untapped realms of profit and success. They’re taking the long view on all of this. Watching ASIMO strut its stuff in the video below, you can almost catch a glimpse of what the robot of the future may look like. There’s almost a human curiosity lurking behind that dark shield of its face. It’s like a child, running through and exploring its world with delight. There’s a harsher reality that I have to address, however. I’ve been looking over our files since this time last year, when we were covering ASIMO’s 9th birthday, and I realized that the robot really hasn’t made any big breakthroughs in the last 12 months. That’s very disappointing. Sure, we should recognize that Honda’s remarkable robot project has made big strides in the last decade, from a moderately capable walking robot to the modern ASIMO which can jog and dance and wave with the best in the field. In fact, in many ways ASIMO is the best in its field – it sets the bar for stability in bipedal walking and navigation. Yet competitor’s, like Kawada and AIST’s HRP series, are getting more human-like, and even out-dancing Honda’s flagship robot. What’s up, Honda? You can’t rest on your laurels. Considering that ASIMO is used in collaboration with various academic research groups around the world, I’m sure that the robot is actually still making steady progress, but it would be nice if Honda used the anniversary to highlight those moves forward instead of simply celebrating the past. …then get back to work. 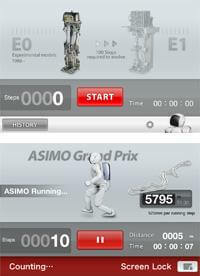 The Run With ASIMO App will be available soon, so you can celebrate the robot on your own smart phone. *Update: Honda has announced that the Run with ASIMO App will be released for Android in late November, and the iPhone version is ‘coming soon’. Users will be able to share their scores on time trials with friends via Facebook and Twitter.